Almost everyone who has been to Africa describes it as among his or her favorite travel destinations. I am no different. When as a single mother, I took my 11 year-old son by myself to Kenya, some wondered about that decision, especially as it was shortly after the 1998 Kenyan bombings. After a couple of unmemorable days in Nairobi (perhaps I shouldn’t elaborate), we headed toward the Tsavo National Park, one of the largest and oldest game reserves in Kenya. Because it was only the two of us, our driver, whose name we later learned was Muguro, picked us up in a smaller van rather than the usual larger Landcruiser. As we headed down what they call a “major road” or highway, we were wide-eyed with clenched fists as he navigated the road’s huge craters. Littered along the road were many overturned trucks and other vehicles sacrificed by the perilous road, but we relaxed as Muguro deftly maneuvered the van. The flight fiascoes we faced en route to Nairobi won’t be revisited here, but suffice it to say we missed our original flight, arriving late sans luggage. While staying in Nairobi and waiting for our luggage to arrive, we purchased one spare set of clothes each and the most basic toiletries. The suitcases had not arrived by the time we left for the safari. As we travelled the potholed road, it quickly became evident our luggage would never make it to the safari site. That actually turned out to be a freeing experience-in the morning, we hung our dirty clothing outside our hotel room door to be washed by the staff, and donned our clean apparel-no decisions to be made about clothing or other grooming. 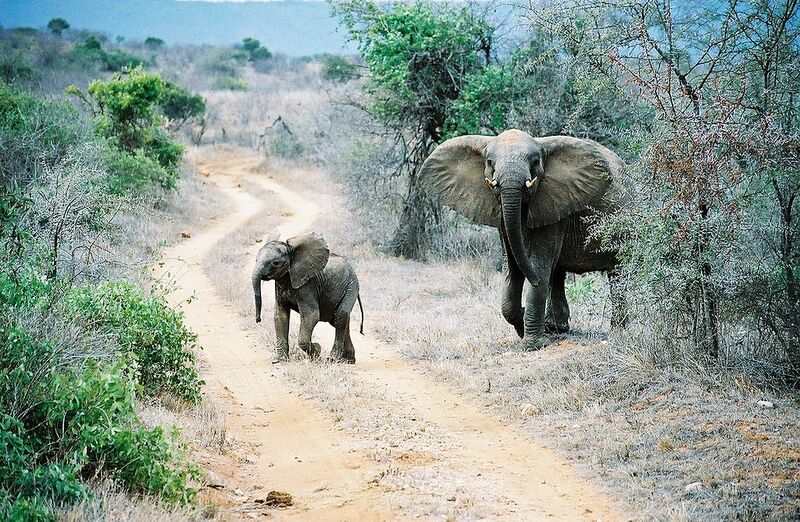 While driving toward Tsavo, Muguro pointed out wildlife in the hills or on the distant horizon. Asking how he spotted them, he said you look for movement or a change in color. That lesson has helped me be far more vigilant in spotting wildlife, whether in Africa, home or other places. Muguro was a quiet, dignified man, speaking only those things that needed to be said. As he took us on our dawn and dusk safari rides with the backdrop of Mt. Kilimanjaro, we gradually got to know him a little better. Besides his excellent skills at sighting wildlife on land, he was keen at identifying the many different birds. He also explained there were about 40 tribes in Kenya, each which had its own language, with most Kenyans speaking English and Swahili. He taught us some Swahili; my favorite word was “twiga” which fittingly means giraffe. Muguro related there were good relationships between the tribes and various minorities at that time. We asked what area he was from, and he told us the Mt. Kenya area. Knowing the Mt. Kenya Safari Club was a popular big game safari and celebrity destination, I asked if he led big game safaris. When he affirmed he had, I asked if he had any interesting memories. By this time, we had been with him for five days, so he was somewhat less reserved, and related that he used to take William Holden on safari. Though not particularly impressed by celebrities, I asked him how those ventures went. He replied that Mr. Holden had sat around and in the tent all day drinking. We loved our twice daily drives with Muguro, his beautiful countenance and incredible skills at spotting and tracking animals. We learned he was a loving father and husband. It was with sadness that we said our good-byes when he returned us to Nairobi. When we were at the Nairobi airport, as we were ready to depart, my son spotted Muguro and ran to give him a hug; Muguro smiled and hugged him in return. 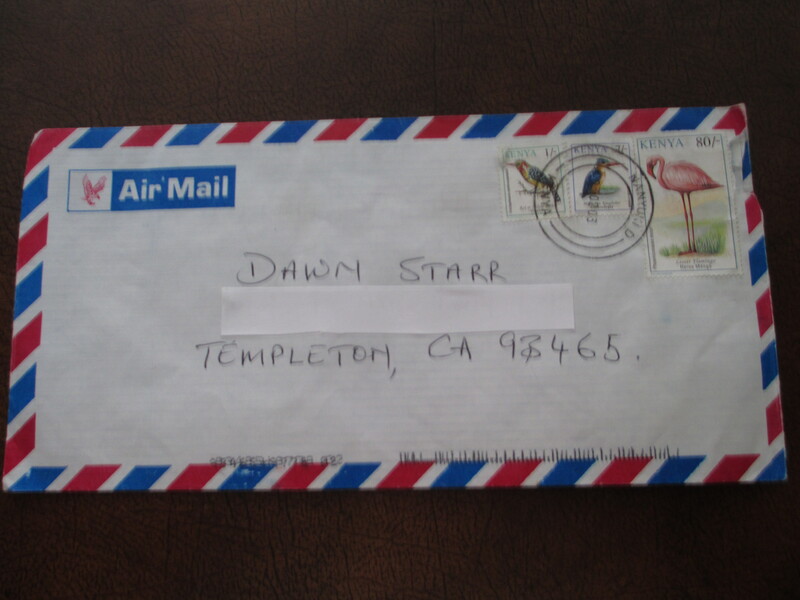 We had already exchanged addresses, and kept in touch, receiving a last letter from him in 2003. Sadly, the next letter I sent came back as undeliverable, and I have never been able to contact him again. Near my home, I recently spotted a camouflaged fox traversing the landscape-a fond reminder our special time with Muguro.